Note: There will be a minimum $5.00 shipping charge on each order for shipping within the U.S. via US Postal Service. Contact Mike for additional shipping options. Major credit cards are accepted. * A Frame Mount is a print mounted and laminated on to a 1/4″ thick board. 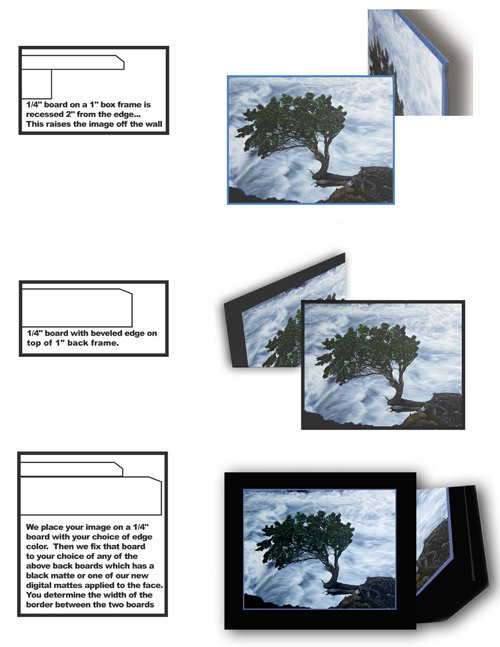 This allows you to bring your photo to your framer and have it custom framed without glass. * A Frame Mount is a print mounted and laminated on to a thick board. * The height of individual panoramic photos may vary a few inches. Custom Gallery Mounting is an inexpensive, highly durable alternative to framing. Gallery Mounting professionally adheres your photograph or artwork with heat pressure. A special UV protective vinyl is laminated over the print using 120 tons of pressure. The edges are then beveled and trimmed with your choice of 24 color/patterned edges. Mike David will be happy to place your order by email or phone, as well as answer any questions you may have.